Growth hormone (GH) has pleiotropic functions in all vertebrates. In addition to its essential role in the regulation of body growth and development, it can also influence reproduction, immunity, osmoregulation, and behavior Immune and neuroendocrine systems have bidirectional communications and it is well document the enhancing action of GH on teleost immune system .It is desirable controlled GH administration to allow growth and stimulation of the innate immune system of fish. In this study, we have characterized a chemical peptide compound, A228, designed by molecular modeling, which is able to perform the function of a GH peptide secretagogue. In pituitary cell culture, the peptide A228 induces GH secretion. It is able to increase superoxide production in tilapia peripheral blood leukocytes cultures and in a macrophage cell line J774 from mice, therefore using this molecule, innate immune system stimulation is obtained in vitro both in fish and in mammals cell cultures. In this paper is also shown the biological action in vivo of the molecule, to assess growth stimulation in tilapia larvae. Keywords : Biological activity, Growth hormone secretagogue, murine cell line. La hormona del crecimiento (GH) tiene funciones pleiotrópicas en todos los vertebrados y juega un papel esencial en la regulación del crecimiento y el desarrollo del cuerpo. También puede influir en la reproducción, la inmunidad, la osmorregulación, y el comportamiento inmunológico. Los sistemas neuroendocrinos tienen comunicaciones bidireccionales y esta bien documentada la acción de la GH sobre el sistema inmune de teleósteo. La administración controlada de GH permitir el crecimiento y la estimulación del sistema inmune innato de los peces. En este estudio, hemos caracterizado un compuesto peptídico químico, A228, diseñado por modelado molecular, que es capaz de realizar la función de un péptido secretagogo de GH. En el cultivo de células pituitaria, el péptido A228 induce la secreción de GH y es capaz de aumentar la producción de superóxido en tilapia. En este documento también se muestra la acción biológica in vivo de la molécula, para evaluar la estimulación del crecimiento en larvas de tilapia. Palabras clave: actividad biológica, scretagogo, hormona del crecimiento, línea celular murina. Growth hormone (GH) is a pluripotent hormone with essential role in the regulation of body growth and development; it can also influence reproduction, immunity, osmoregulation, and behavior (1).It is produced by the pituitary gland in teleosts as in other vertebrates .GH gene is also expressed in other tissues of fish, especially in lymphoid organs and cells (2). The expression of GH is tightly regulated by several factors. There are have been demonstrated the interactions among elements of the endocrine and immune systems in fish. And it is desirable controlled GH administration to allow growth and stimulation of the innate immune system of fish. The moleculeA228 was described by the exhaustive molecular modeling of the human GRLN receptor using bioinformatics tools, after which a virtual library was built and a massive docking experiment was performed against the receptor model (10). Previous results have demonstrated the biological activity of another GHS , the peptide A233 , that induces GH secretion and it is also able to increase superoxide production in tilapia head-kidney leukocyte cultures. This effect is blocked by preincubation with the GHS receptor antagonist [D-Lys3]- GHRP6.and GH immunonetralization experiments propose a GH-mediated mechanism for the action of A233. The in vivo biological action of the decapeptide was also demonstrated for growth stimulation in fish larvae and the enhancement of some parameters of innate immune system in the treated larvae. The aim of this study was to assess the biological activity of another GHS, the synthetic peptide A228 as a stimulator of growth and the innate immune system of teleosts fish, through studies performed in vitro and in vivo. 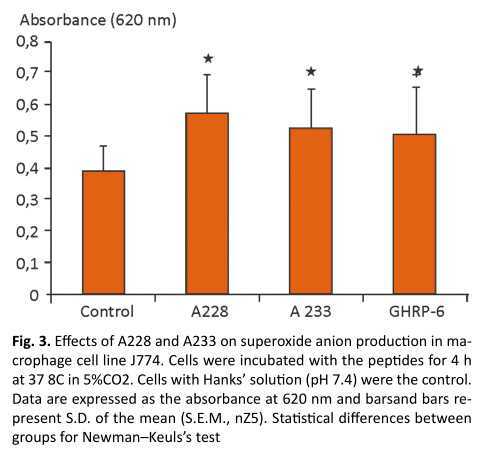 It is also interesting to know if in a murine macrophage cell line J774 , the A 228 could stimulate the superoxide anion production . (CPAM). Fish were kept alive in aerated freshwater under a 12 h light:12 h darkness photoperiod. They were fed commercial dry diet for fish (CENPALAB, Habana, Cuba).Water temperature was maintained at 26 and 28 8C. All animal experiments were previously approved by the Ethics Committee of the Center for Genetic Engineering and Biotechnology, Havana, Cuba. The decapeptide A228 (GKFGDLSPEHQ) y A233 (GKFDLSPEHQ) with an internal lactam bond between side chains of underlined amino acids) was manually synthesized on a solid-phase support. Crude peptide was purified by reverse-phase, high-performance, liquid chromatography up to 95% on a C-18 preparative column with an acetonitrile/water linear gradient. Trifluoracetic acid was used in both solvents for counter-ion pair formation. The correct sequence of the purified peptide was confirmed by electrospray mass spectrometry (Micromass, Manchester, UK). The positive control used was GHRP6 (Lipotec, Barcelona, Spain) lyophilized peptides were reconstituted in PBS. aspirated repeatedly through a pipette during enzymatic treatment to promote dissociation of cells. The process was terminated by the addition of 0.5 ml (20%) fetal bovine serum (Sigma). Cells were counted on a hemocytometer under a light microscope and viability determined by trypan blue exclusion. Viability of the cells was always O95%. Cells were then plated at a density of 4.0!105 cells/well into a 24-well plate (Falcon, Primaria 24, Becton Dickinson, Franklin Lakes, NJ, USA) at a volume of 300 ml/well of isotonic medium supplemented with 10% fetal bovine serum. The cells were preincubated for 4 days at 26-28 8C under a humidified atmosphere of 95% O2 and 5% CO2, with one change of culture medium at 48 h post-plating. Before each experiment, cells were washed once with serum-free medium. A final 300 ml serum-free medium was added containing A233, GHRP6 (Lipotec), or control medium without hormones. The medium was replaced at 4 h.Incubations were terminated at 8 h, and hormone release was quantified for the 0-4 and 4-8 h intervals. GH release was expressed as secretion per unit volume of medium (ng/ml). The GH secreted in vitro was measured using a noncompetitive ELISA as described by Lugo et al. 2008 (11). The 96-well MaxiSorp plates (Nalge Nunc International, Roskilde, Denmark) were coated (3 h at 37 8C) with anti-tilapia GH monoclonal antibody 1 (tiGH1 mAb; CIGB, Santi Spiritus, Cuba) at 10 mg/ml in 0.05 M carbonate buffer (pH 9.6, 100 ml/well). The plates were washed two times with PBS-T (137 mM NaCl, 2.7 mM KCl, 4.3 mM Na2HPO4 .7H2O, and 0.05% Tween 20, pH 7.3) and blocked with 3% skim milk (Oxoid, Cambridge, UK) in PBS 1! (200 ml/well) for 1 h at 37 8C. A standard tiGH curve in the range of 35-0.136 ng/ml was obtained by twofold dilutions in 0.5% skim milk in PBS 1!, dispensed by duplicate in the same plate. Test samples were diluted at a ratio of 1:2 as described earlier and were incubated on the plates overnight at 4 8C. After washing the plates four times with PBS-T, 100 ml HRP - tiGH2 mAb conjugate (CIGB), diluted at a ratio of 1:15 000 in PBS 1!containing 0.5% skim milk, were added to each well. The plates were incubated for 1 h at 37 8C and then washed eight times with PBS-T. Then, the substrate buffer (0.2 M Na2HPO4, 0.1 M citric acid (pH 5.0) containing 0.5 mg/ml ortho-phenylenediamine and 5 ml 30% H2O2) was added (100 ml/well). The reaction was stopped 15 min later by adding 50 ml of 2.5 M sulfuric acid per well. The absorbance was measured at 492 nm using the Titertek Multiskan Plus spectrophotometer. The accepted upper limit of the assay background was 0.094. The lower detection limit of the assay was 0.1 ng/ml. The degree of variation and intra- and interassay coefficients of variation are 3.90 and 13.45% respectively. Peripheral blood leukocytes were isolated as described by Acosta et al, 2010(12) .Tilapias were anesthetized in tricaine methanesulfonate (MS222), and blood was collected from the caudal vessels using a heparinized syringe. Blood was diluted 1:2 in RPMI-1640 medium, containing 4 μg/mL of gentamicin. The mixture was placed on Ficoll-Paque™ Research Grade (Amersham Pharmacia Biotech, Sweden) and centrifuged at 400 g for 25 min. The leukocyte band was harvested, washed with phosphate-buffered saline (PBS, pH 7.6), and suspended in RPMI-1640 medium with 0.5% tilapia serum, and cultured at 25 _C, in 5% CO2 for 24 h. Leukocyte viability was assessed by trypan blue exclusion (viability N95%). Murine macrophage cell lines J774 was obtained from the American Type Culture Collection (ATCC ). The cells were cultured as monolayers in Dulbecco's Modified Essential Medium (DMEM) F12 supplemented with 20% fetal bovine serum,100 mg/mL penicillin/streptomycin, and 2mM L-glutamine (Mediatech, Inc., Herndon, VA) at 37 1C in a humidified atmosphere of 5% CO2. The cultured cells were grown to 70-80% confluence in 75 cm2 flasks for preparation of samples that were used in further analysis. of 1 month. Three experimental groups were handled with the following treatments: groups 1 and 2 received the peptides A228 and GHRP6 (positive control) at a dose of 0.1 mg/l, respectively, and a no treated group in the third one. Growth-promoting effects were evaluated by measuring the body weight increase. Results were evaluated using GraphPad Prism version 4.0 for Windows, GraphPad Software, San Diego, CA, USA. All results are expressed as the mean ±S.D. Statistical analysis was performed using one-way ANOVA by Newman-Keuls's or Dunnett's method for data with normal distribution and equal variances: GH assays, superoxide production, growth performance experiment of tilapia (Oreochromis sp.) larvae. Data with unequal variances were analyzed by the Kruskal-Wallis test followed by Dunn's multiple comparisons post-test. Treatments were considered to be significantly different if P<0.05. The molecules A 228 and A233 (Fig. 1) were selected from the virtual libraries described by Rodriguez et al. 2007(10), and, in order to determine in vitro and in vivo whether this novels mimetic molecules function as GHSs, the following assays were conducted on the growth and immune system. To evaluate the effect of A228 and A233 peptide on GH secretion, we performed an in vitro culture of cells in the pituitary gland of tilapia (Oreochromis sp.). the peptides at a concentration of 10 nM stimulated GH secretion at 8 h by cells in the anterior pituitary gland (Table). The stimulatory effect of GRLN and GHSs on the release of GH in vitro by the pituitary gland has been reported in mammals, birds, and different species of fish (14,15,16 17, 18). Superoxide anion produced by cultured tilapia (Oreochromis sp.) 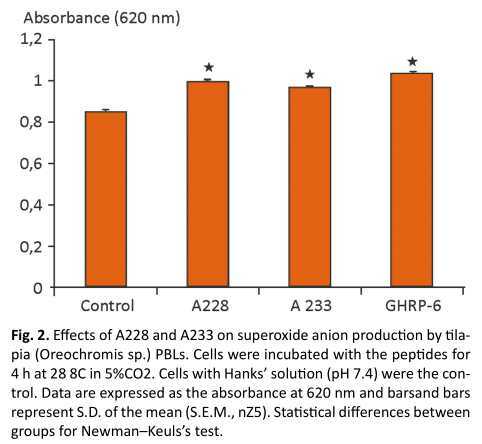 PBLs were measured by the addition of A 228 as positive control GHRP-6 was included and also A233, which in previous results was capable of enhance superoxide anion production in leukocytes from tilapia head kidney. The peptides induced significant increases in superoxide production. The concentration of peptide used was 10 n M taking in consideration previous results ( 19) , The increase of superoxide anion production was statistically higher in cells stimulated with the peptides, to compare with no treated cells, among the different treatments there were not statistical differences, in both cultures, PBLs ( Fig. 2 ) this effect is similar to that reported by Acosta et al. 2010,(12) who stimulated phagocytic peripheral blood cells of tilapia (Oreochromis sp.) with recombinant tiGH (Oreochromis hornorum). Experiments were performed to evaluate the biological effect of the peptide on the growth rate of tilapia larvae. The effect of these peptides on fish growth was determined by measuring the increase in body weight. The tilapia larvae treated with A228 showed a significant increase in body weight compared with the controls as well as the larvae treated with GHRP -6 , just 9 days after treatment. In this study, we demonstrate the effect of another peptide molecule having internal cycles and composed solely of L-amino acids that are capable of exerting, due to their chemical structure, similar functions to those attributed to GRLN, des-acyl GRLN, and other peptidic GHS. They are a group of peptide compounds and peptides capable of stimulating production and GH secretion in vitro and in vivo. There were not differences between both peptides A228 and A233, the structural difference do not interfere on GH secretagogue function at least in this kind of primary culture of pituitary cells experiment. Our results are similar to those obtained in tilapia (Oreochromis mossambicus), where the effect of GRLN on GH secretion in vitro was dependent on the concentration of the endogenous secretagogue used (15). Other researchers have reported the stimulatory effect of the synthetic peptides GHRP-6, PACAP, and PACAP-related peptide from Clarias gariepinus on the release of GH in vitro by the pituitary gland of tilapia (Oreochromis niloticus); (11,19).There should be conducted an experiment using the A228 peptide to study the GH releasing in vivo after the administration of GHS. It has been reported that the immune system of both fish and mammals possesses both non-specific and specific immune responses with cellular and humoral components. However, fish depends more heavily on non-specific defence mechanisms. The use of immunostimulants given as dietary supplement can improve the innate defense of aquatic animals principally fish and thus providing resistance to pathogens during period of stress, such as grading, sea transfer and vaccination. In our result we could state the biological action of or peptide in fish and mammals system, There are controversial reports about the effects of ghrelin on phagocytotic activity of leukocytes. In fish (rainbow trout), the administration of ghrelin increased phagocytosis and superoxide production in zymosan-stimulated leukocytes, which was abolished by pretreatment of leukocytes with a GHS-R antagonist (2). It was also shown that ghrelin increased mRNA levels of superoxide dismutase and GH in leukocytes, suggesting that the effects of ghrelin was mediated, at least in part, by stimulating GH secretion from leukocytes. On the other hand, ghrelin administration reportedly reduced the elevated phagocytic activity of peritoneal macrophages induced by acute cold-restraint stress in rats ( 22 ) . In our study we have found an increase of superoxide anion in fish PBL and cell line J774 from murine macrophages after A228 stimulation even has been reported that ghrelin modulates phagocytosis directly or indirectly via GH, but in a different way in different species it should be considered the treatment conditions to evaluate this biological activity. GHSs are useful molecules as growth enhancement molecules These synthetic molecules are effective in stimulating production and release of endogenous hormone as a physiological response, with no side effects on the pituitary or toxicity potential; besides their low molecular weight, it makes a better entrance to the organism. In our laboratory, we have successfully employed the immersion bath technique to study the effects of nutritional supplements and growth factors on growth control and the immune system in fish (12). The immersion bath method used for our studies requires little manipulation and causes minimum stress to fish during treatment. There is evidence suggesting that the gill pillar cells are a possible entry site for some molecules when fish are treated by immersion bath (6). This study evaluated the biological function of synthetic peptide A228 on weight gain of tilapia (Oreochromis sp). Tilapia larvae showed a significant increase in growth after 9 days of treatment with peptide A228 (0.1 mg/l). All animals received the same commercial diet, so the increase in weight and height is due to the administration of peptide A228. 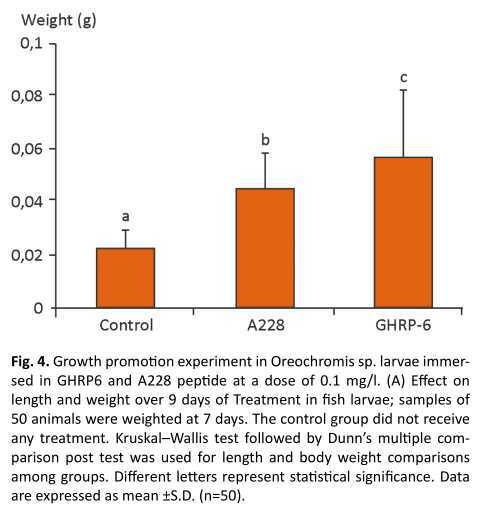 The positive control group represented by the fish treated with the peptide GHRP6 significantly increased their growth. Similar results were obtained in a former work to administrate A233 peptide, another GHS, to fish larvae enhancing growth and some. humoral innate immune system parameters (Fig. 4)(19). These results are similar to those found in mice where there was an increase in body weight after dosing by s.c. injection of the synthetic peptide GHRP2 (23). In adult rats, GHRP6 also increased body weight (24) as well as other GHSR agonists, like SM-130686 administered orally (25) and BIM-28131 administered by s.c. injection (26). It has been reported that GHSR1a agonist, a pentapeptide with D-amino acids, promotes weight gain in rats, by i.p. administration during 7 days (27). Moreover, the administration, by the same method, of GH tilapia (O. hornorum) secreted into the culture supernatant of yeast Pichia pastori (28) to larvae of tilapia (Oreochromis sp. ), significantly increased growth of these animals. Administration of tilapia recombinant neuropeptide Y (Oreochromis sp.) to larvae of African catfish (C. gariepinus) also produced an increase in animal weight (29). In addition, treatment with PACAP and PACAP-related peptide from C. gariepinus larvae of African catfish (C. gariepinus), tilapia (O. niloticus), and common carp (Cyprinus carpio) increased body weight and length in three fish species (11). To summarize, the action of this GHS has been assessed employing in vitro and in vivo methods, we have demonstrated the effect of a new growth hormone secretagogue , A228, as a growth hormone secretagogue, that elicits GH in tilapia pituitary cell culture and also has stimulatory effect on the superoxide anion production on tilapia PBL and a cell line J774 from mice macrophages .To administrate the molecule using immersion baths, the weight gain is enhanced in tilapia larvae . These results support the interrelation between endocrine and immune system. 3. Magnadottir B (2006) Innate immunity of fish (overview). Fish and Shellfish Immunol. 20: 137-151. 10. Rodriguez R, De la Nuez A, Estrada MP, Martinez R, Chinea G, Reyes O, Fernandez R, Garcia D, Berlanga A & Musacchio A Compounds analogous to growth hormone peptide secretagogues and preparations containing them. 2007 (Patent publication No. : WO 2007/098716 A1). 13. Yada T, Kaiya H, Mutoh K, Azuma T, Hyodo S, y Kangawa K (2006) Ghrelin stimulates phagocytosis and superoxide production in fish leukocytes. J. Endocrinol. 189: 57-65. 20. Secombes, C.J., The nonspecific immune system: cellular defenses. In: Iwama, G., Nakanishi, T. Eds. The Fish Immune System: Organism, Pathogen, and Environment. 1996 Academic Press, New York, pp. 63_103. Siwicki, A.K., Anderson, D.P., Rumsey. 21. Janeway CA, Jr Medzhitov R : Innate immune recognition. Ann Rew Immunol 2002 ; 20: 197- 216. Recibido: 14 de marzo de 2016. Aprobado: 20 de mayo de 2016. 1 Biotechnology Animal Division, Aquatic Biotechnology Department, CIGB, PO Box 6162, Havana 10600, Cuba. 2 Escuela Cs. Ambientales, Laboratorio Fisiología de Peces. Universidad Católica de Temuco. Chile. 3 Physico-Chemistry Division, Center for Genetic Engineering and Biotechnology, PO Box 6162, Havana 10600, Cuba.